If you sit down at my computer and look through my web search history from say, a year or two ago, you’d find what you might expect: evidence of my tango obsession. Queries such as: Where to buy the latest Comme Il Faut tango shoes in NYC? Or, what is the ratio of men to women at every milonga in the tri-state area? Or, what’s the weather in Buenos Aires? And, is there tango in Trenton? Though lately, my concerns have taken a decidedly different turn. These days I find myself shopping for things like dependable bed wetting supplies, and attractive waterproof sofa covers, or searching for information about the causes and remedies for urge incontinence. I’ve also been watching YouTube videos on the best way to convert baby diapers into doggie diapers. And just to allay any concerns that you may have for me, I’m happy to report that I’m not in the middle of this type of health crisis–yet–but my dog is. 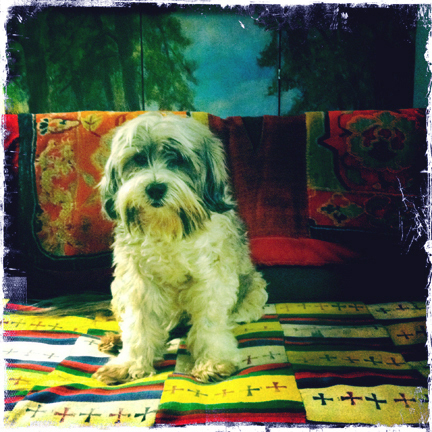 My fourteen-and-a-half year old beautiful, precious, obstinate, funny, Tibetan Terrier is beginning to fail. Most of my free time, with my pup’s reluctant blessing, used to be taken up with everything tango—dancing my way through the week. Now, much of my days and nights and thoughts are dedicated to the care of my feisty, four-legged, octogenarian (in dog years); Tingri. My best girl. At the beginning of our journey’s end, I made my way to a section of the A&P that I knew very little about, the baby care aisle. There I stood, head in hands, trying to choose between Pampers Cruisers adorned with Bert, Ernie, Elmo and Big Bird or Huggies Little Movers decorated with Disney characters. I chose Elmo: Tingri’s ethos has always felt much more like Sesame Street than Walt Disney. This is my first hands-on experience with elder care and it has been quite a ride; at times very funny, sometimes heartbreakingly poignant, and often frustrating with overtones of relentlessness. I can’t say that Tingri has taken that well to wearing diapers, or being dressed at all for that matter. She has a charming habit of ripping them off, destroying the nappy and spreading its sodden contents all over my apartment—every hour. Even a velcroed diaper cover didn’t keep them on her. My determined little Houdini, managed to remove the diaper–while leaving the cover on–in a move not unlike yanking a tablecloth out from under the table setting or removing your bra through one sleeve without taking off your shirt. I’m just now realizing how my life has been altered since my apartment became the equivalent of a canine nursing home. I’m reluctant to invite friends over, my kitchen counter has become a diaper prep station, and conversations about tango have been replaced by the physical woes of my scruffy, aging pup. Last week I bumped into a friend in the hardware store. I was buying Goo Gone and Gorilla Tape, provisions for my baby-diaper-to-doggie-diaper conversion. My friend asked if I was doing some home repair. I told him that Tingri was incontinent and it was less expensive to convert baby diapers than buy expensive dog diapers. I went into great detail explaining how I cut a hole for her tail, reinforced that hole with strips of Gorilla Tape, and then cleaned my gunked up scissors with Goo Gone every two or three diapers. He just stared. “You know Nancy, you could have just told me you were doing some home repair,” he said. I also dance less, though every now and then I do take a break (which may be more of an escape) to head to a milonga for a much-needed change of scenery and for the chance to slip into that blissful dancing meditation that tango can be. Even then, Tingri is always in my thoughts. Whether I nuzzle my partner’s neck, or give him a couple of swift pets in praise of a dance well done, or wonder what kind of a mess I’ll find when I get home, she is with me. I often leave the dance early—even before the stroke of midnight to head home and check on her. Tingri and I made a contract fourteen-and-a-half years ago. I promised to love and care for her and she promised me nothing. I’ve loved (almost) every minute of it and cannot imagine my days without her. Here’s to you Tingri, with all my love. My best girl. Tingri chose YOU oh-so-very-wisely, Nancy. You’re the best thing her soul could have been guided toward for the love and protection she deserves…and for all these years. How lucky can a Tibetan Terrier get! Thank you for such a real and poignant post, a demonstration of deep care and love-in-action…and gratitude for all the good and authenticity you always bring to our world in deed and word. My deepest wishes to both of you. Oh thank you so much Daniel–your comment is so kind. Yes, a lucky Tibetan! Beautiful and thank you for sharing, Nancy. I’m sorry and sad that you both are going through this. Many aspects to life. Enjoy and love her. Tango will always be there. Thanks Suzanne. Don’t want to make a comparison, but I know you know what is is to love and care for the elders in your life. Thanks so much for posting this, Nancy. I’ve been through this with my darling Benbird and time is now creeping up on Finley. It’s easy to love them when they’re healthy and easy, but the true love is how you treat them when they’re not. You and Tingri are so lucky to have found each other. Thank you Marty. It has been a true test of character that’s for sure. Sad and funny and exasperating. While I’ve still got her, I’ll do my best to enjoy it all. I know all dog lovers and pet owners know. Nancy – oh, yes, the dogs of ours, present and past… Thank you for sharing, and for referring to this between last week’s dances: In tango there’s sometimes room for a couple of “thought tracks” while dancing, and sometimes it’s good to be explicit about them. I usually don’t talk that much about what is going on while not dancing but every once in a while I do. See you over the summer. Love how you wove these two important aspects of your life. Thanks for sharing a glimpse of this beautiful relationship with us. The portrait of Tingri at this stage of her life–both in writing and in that photo–are both stunning. Thank you Shawne for your kind words about us and also for your actual words that I used in the first sentences of the essay. I am happy that I ran into you and baby-girl Tings today! Nice to see you too Leslie and thanks for listening to, and reading our story. Truth. We think we are teaching them – yet, as it turns out – they are teaching us. Beautifully articulated and, as always, with great humor. Thank you Laura. This is a very poignant time, as you well know. I guess it’s just my turn. Oh, Nancy, this is heart-felt. Eileen and Larry of Foxhollow. Thank you Eileen and Larry.